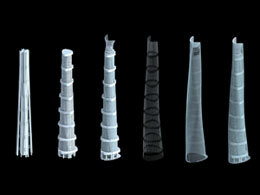 Developer: Shanghai Tower Contruction Development Co., Ltd. The Shanghai Tower is a spiraling form that will rise 128 stories--632 meters (2074 feet) to become Shanghai's, and China's, tallest skyscraper. The structure is described by its government client as "a symbol of a nation whose future is filled with limitless opportunities." 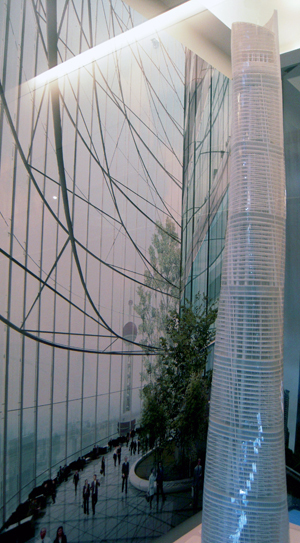 Organized in nine cylindrical sections, the segments are placed atop of one another, the tower has a double-skin facade that encloses the stacked buildings, while a triangular exterior layer creates the second skin, which rotates as it rises. The spaces between the two façades create nine atrium sky gardens. Thornton Tomasetti, the structural engineers on the project, describe the exterior of the tower as a "gently twisting triangle that tapers with height and drapes around an inner concrete structure." 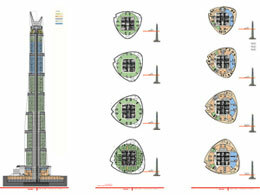 Shanghai Tower emphasizes sustainable design and innovative high-performance features. The asymmetrical outer facade lowers the wind load by 24 percent, making possible a lighter, simpler structure and double skin that defines usable interstitial space. The circular inner facade reduces its glazing by 12 percent compared to a conventional rectilinear building. Amenity floors make use of the dual-skin and soaring atrium spaces to define each community of the different programs of vertical neighborhoods they serve. *All graphics courtesy of Gensler.